For the "Lost Generation", World War I was the Great War, the War to End All Wars. Today, what we remember are the numbers - 100 years ago, 19th century tactics against 20th century tech, hundreds of men charging to their deaths between the trenches. The war has stopped becoming deeply personal. Lost in the statistics is the fact that it claimed the lives of individual people who were spoonfed abstract notions of brotherhood, liberty, and country. We don't think about their suffering anymore simply because too much time has passed - and because there is still quite enough suffering today. But The Grizzled has stepped in so that we can experience some of that suffering. It is a cooperative card game that puts you in the shoes of French infantrymen trying to survive in time for the war's end. You play, win, and lose together, trying to answer the game's tagline: "Can friendship be stronger than war?" Before you find out, you need to know how to play. Here's the quick version; for the full explanation, check out Eric's video review. The game moves through Missions, and you deal out Trial cards from the Peace deck. When the Peace deck is gone and you can see the Dove of Peace, everyone wins. 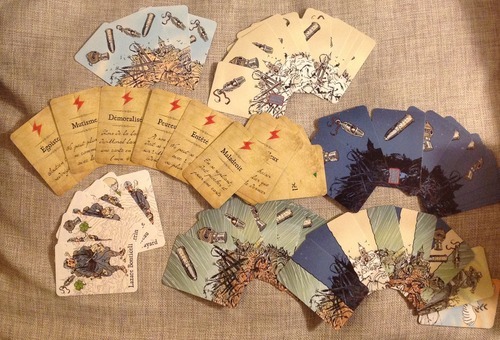 Different cards in the original French game, courtesy of boardgamegeek. There are 6 types of trials, and you must play these Trials from your hand without talking about what your hand contains. But if there are 3 types of any Trial at a time in the center, you lose the Mission. So you can withdraw from the Mission in order to help your friends, but any cards you have left in your hand will add cards to the Peace deck, making it harder. See the Peace card in the center? We almost won! But Eric died of his wounds, so we all lost. Two things are immediately apparent about the game: first, it is really, really hard to beat. Trials that are Traumas, Traps, and Phobias make it difficult to complete Missions. One bad Mission will eventually cause the Peace deck to just fill up and make it impossible to win. Second, there is just so much grief inherent to the game and its creation. The soldiers you play as have the names of actual people, the designers' ancestors, who fought in WWI. These same names are carved into a Monument card, placed opposite the Peace card, which signals that you have lost the game. And artist Tignous was killed in the attack on French satirical magazine Charlie Hebdo earlier this year just after submitting his final illustrations. This makes playing a very emotional experience. At the very least, you don't talk about the Trials in your hand, which in some sense parallels the reluctance of trauma sufferers to speak of their experiences after the fact. Anyone who hadn't been through it simply wouldn't understand. Can friendship be stronger than war? I do hope so, but The Grizzled makes me skeptical. I think it is a "must buy". The game simply seems set up to make you fail, which I love since so many friends did die during the war. It is a work that delivers a very tough experience which is highly relevant to its theme, and hits on emotionally bittersweet spots along the way. The homage to Tignous, bottom right.